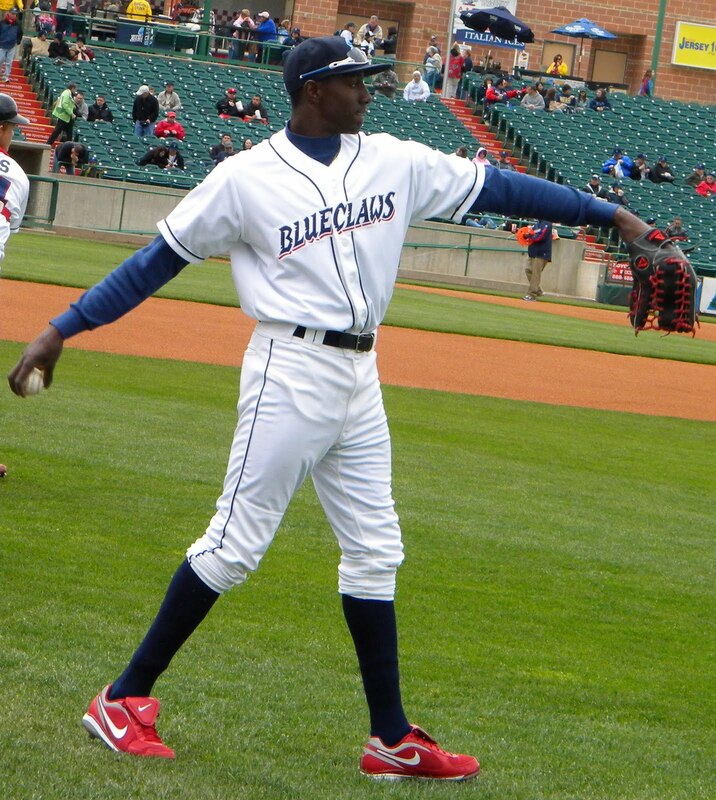 Jiwan James is a 2007 OF/P with a 6’4”, 170 lb. frame from Willistan FL, who attends Williston HS. He has a long and lean build with wiry strength and easy, balanced actions. James is a three-sport athlete with Division I talent in both football and basketball as well as baseball and he does things so easily and smoothly that it looks almost casual. James is one of the top defensive outfielders we’ve seen at this level. He’s a 6.68 runner with long, easy strides that eat up ground. His combination of arm strength, accuracy and release is unsurpassed at this level and he might end up throwing 100 from the outfield when he gets stronger and is a full-time baseball player. Offensively, James is a switch-hitter with raw hitting skills but good bat speed and very good hands. He’s better from the left side now, where he hits from a spread stance and can drive the ball to all fields. Overall, James is a high ceiling athlete who loves baseball and who is one of the best makeup kids in the 2007 class. He’s signed to go to Florida but will get high level draft interest before then. James entered the draft drawing interest as both a pitcher and an outfielder and had the leverage of a scholarship to Florida. The Phillies originally told James they’d take him in the 6th round of the draft, but James turned down the money offer. They ultimately selected him in the 22nd round, but kept the 6th round money on the table. Even so, it appeared that James would forego signing, as he enrolled for classes in late-June and the Gainesville Sun ran a story that he would be attending Florida. The Phillies upped their ante a bit, as a day after the story ran, James did indeed sign with the Phils. Career Synopsis: James was selected by the Phillies as a pitcher and began his career throwing 33 highly forgettable innings in the GCL. He came down with a stress-related right arm injury and was shut down during the 2007-08 offseason and ultimately missed the entire 2008 season due to the right biceps injury. James suffered several recurrences of the arm issues which led to his conversion from pitching to hitting. He went into camp in 2009 as an outfielder and after staying in Florida for extended spring training, he made his debut as a hitter in Williamsport. He got off to a good start, putting up a .264/.336/.372 line with 22 Ks and 11 BBs and seven steals. He suffered a left wrist injury and was shelved for a month. He then apparently put on a show in the Florida Instructional League. Heading into 2010, James was ranked 11th among Phillies prospects by Baseball America, 16th by John Sickels, and 7th by Baseball Prospectus. He headed to Lakewood for his first taste of a full-season league. The season could be considered mediocre at best. On the up side, James compiled a 24-game hitting streak and played an excellent centerfield and showed a better than average arm. However, his OPS (.686 on a .270/.321/.365 line) was slightly below the SAL average and while he clearly has plus-plus speed, he had base-running and base-stealing problems. Most importantly, James showed very little knowledge of the strike zone, as he posted a K rate in excess of 21% and BB rate at about 6%. Despite the uneven performance in 2010, BA elevated James to 7th in its 2011 rankings, while John Sickels dropped him a spot to 17th. Summary: James remains crude as a hitter after his transition from the mound to the batter’s box, but he does have substantial tools. Right now, his best assets are on the defensive side of things, as he has excellent speed that gives him the ability to track down almost anything hit near him. As a converted pitcher, he has a huge arm, which profiles well in centerfield. Though his power and contact abilities are below average now, as he gains experience both tools could be average, maybe even a tick above, especially his power. Upside: James took a step backwards in 2010, due primarily to a deteriorating batting eye that resulted in a 132/35 K/BB ratio in 600+ PAs. He’s not unlike the spate of other toolsy high school outfielders the Phillies have recently drafted in that his tools are way ahead of his skills at this point. Unlike the others, though, James started two years in the hole due to a season as a pitcher and missing 2008 with an injury. As a result, he’s been about a level below where he should be agewise had he followed a normal prospect progression. James is a better hitter lefthanded than righthanded, and the lefthanded swing and lanky frame have drawn some comparisons to Domonic Brown (albeit only from the most optimistic observers). James still has the upside of a big league starter, but 2011 is shaping up as a critical season for him. Without cutting down on his strikeouts and simply improving on his hitting as a whole, James will be pushed by the crop of similar OFs coming up behind him in the system. Making those improvements in the pitching-friendly Florida State League will be a challenge. thanks, I uploaded the wrong picture, my bad. Fixed. James could end up being a miss but this kid has huge potential if he learns more. He’s a big time athlete and a terrific CF but he looks lost at the plate too often. I’ll root for him because he’s a good guy but time will tell….